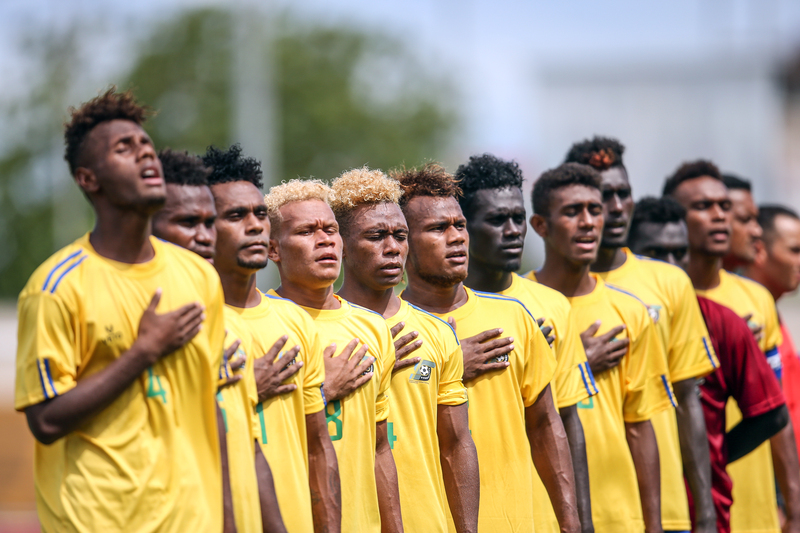 Solomon Islands have booked a semi-final with Tahiti at the OFC U-19 Championship after topping Group B with a narrow 1-0 win against Vanuatu today in Papeete, Tahiti. Already assured a place in the semi-finals heading into the ecounter, Solomon Islands entered the match without their usual best. Head coach Batram Suri made some changes to his starting lineup leaving Marcus Chan and Ali Mekawir on the bench. Raynick Laeta and Frank Kabui featured from the start as both players having few half chances up front. Solomon Islands closest of opening the scoring was a free kick by central defender Aengari Gagame in the 13th minute. The defining moment arrived two minutes later in the 15 minute as Patrick Taroga scored his second goal of the tournament with a header. The scoreline was 1-0 at half-time when both teams went back into the dressing room. Making his first appearance in the tournament, striker Simon Jedzini had two good chances to score but lacked the cutting edge in the attacking third of the pitch. Zidane Maguekon received a red card to make matters worse for Vanuatu as they were reduced to 10-man. Despite their numerical disadvantage, Vanuatu continued to put pressure on Solomon Islands in the later stages of the match. Solomon Islands held on for a narrow 1-0 victory making it three wins from three matches and qualifying for the last four as group leaders. Head coach Batram Suri expressed his delight of topping the so called ‘Group of death’. “I am very pleased with what we have achieved so far because we came into this tournament aiming to top the group”, he said. “The boys deserved it as a result of their hard work off and on the pitch. “We didn’t play well today especially in the first half but a win is a win”. Suri stressed they are not resting on their laurels since a difficult game against Tahiti is just two days away. “Now we switched our focus on the hosts, Tahiti is a strong team and we need to prepare well for them”, he added. “Tahiti are the hosts so they will have the home support but like I said before, we’re here to challenge and compete”. Vice-captain, Aengari Gagame said they will continue to work hard ahead of the semi-final. “We didn’t have a good game today against Vanuatu, we’ll keep working hard in preparation before the big one with Tahiti”, he said. Meanwhile, Gagame called on all Solomon Islanders to rally support behind the team. “We know that everybody home expected us to win, we have achieved our first target which is to top the group”, he stated. Solomon Islands will take on Tahiti in the second semi-final at Stade Pater on Thursday at 3:30pm.